It’s been a busy time since the eclipse on 27 September, primarily because I am running around trying to get ready for my Open Studio Event in 7 days. But that is a subject for another post. 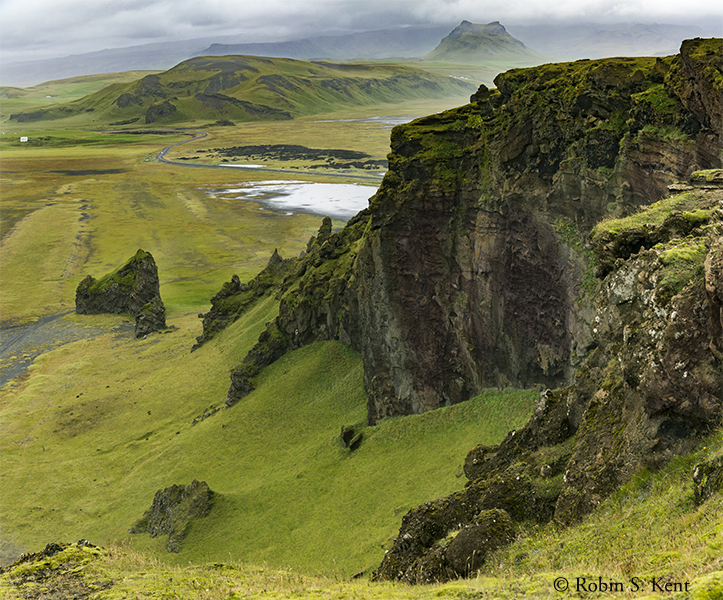 Today, it’s time to bring out some more images from Iceland. Readers may have noticed that Icelandic place names tend to be extremely complicated and hard to pronounce. 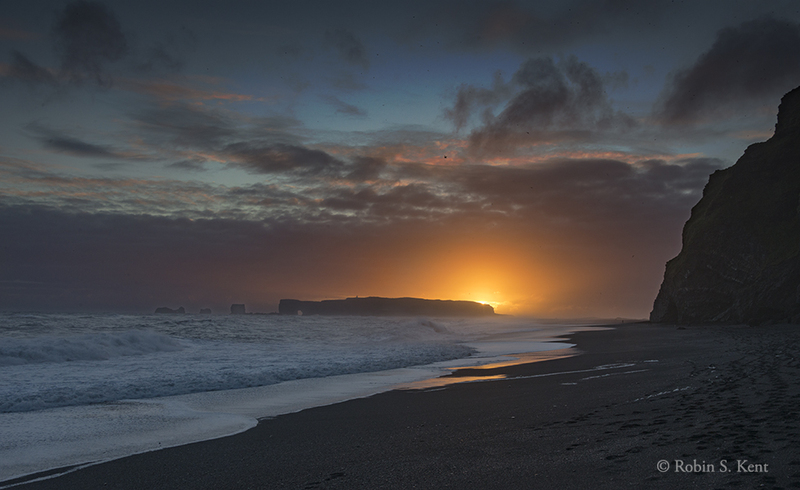 But there is at least one exception, the small town of Vik located on the south coast. Perhaps the most notable feature here is its black sand beach, characteristic of a country populated by active volcanoes. 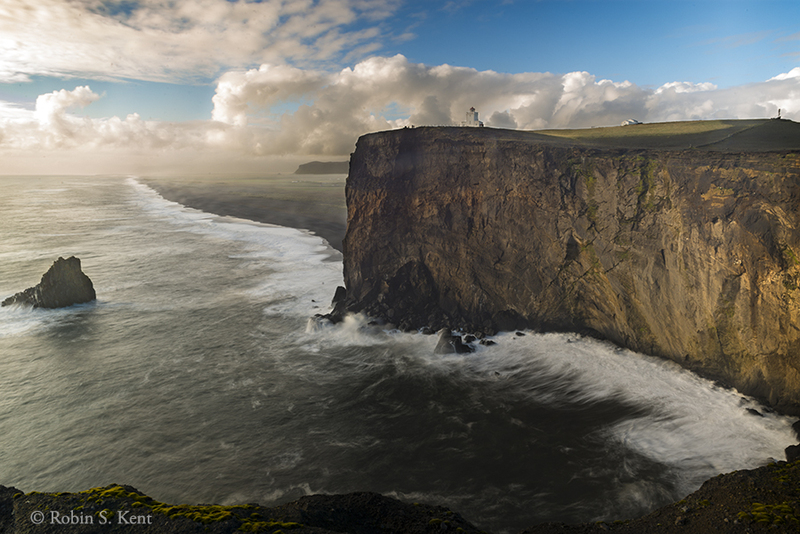 Not far away are the cliffs of DyrhÓlaey where we spent the good part of the afternoon. One doesn’t have to walk far from the parking lot to get a good view. The classic vista here, however, is from a promontory that looks back toward the cliffs. It is only about a 10 minute walk from the location shown above. This is a perfect example of how the scenery can radically change in a very short distance. And after a 20-second stroll to the opposite edge of the promontory one is treated to this view. 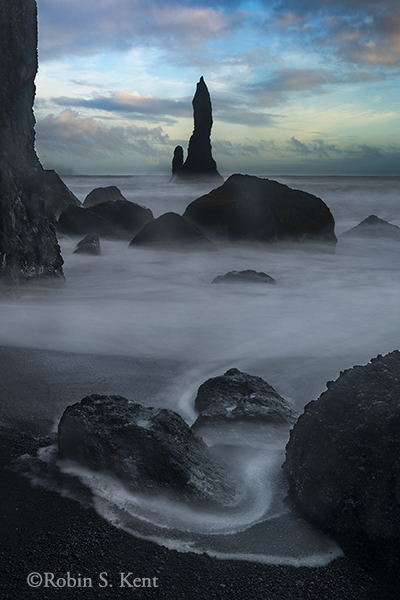 That evening, the group visited the Reynisfjara Beach, best known for its sea stacks. One thing to remember about photographing on a beach close to the water is the need to pay close attention to the waves. I have always observed that precaution, except for approximately 3 seconds on that evening when I turned to respond to a question from another member of the group. In that brief moment an unusually large wave pounded ashore with surprising speed and water was suddenly rushing past me above my knees. I turned to rescue my camera and tripod but it was too late. My camera was down, I followed, and I saw another member of our group being dragged into the ocean while he desperately held his camera and tripod above the water surging around him. One of the tour leaders reacted quickly and grabbed that camera before the water claimed it. With his hands free, the downed member was able to get back up about the same time I did. I retrieved my camera but it was ruined, as was the lens. The photographs on the card, however, were unharmed. The image below was taken just a few minutes before this happened. Fortunately, I had a back-up camera body and lens and managed to capture the sunset about 40 minutes later. Keep Shooting (but watch those waves)……. This entry was posted in Iceland, Landscapes and tagged Iceland, landscape photography, Sunset, travel, what to see, Where to Go by Robin S. Kent. Bookmark the permalink. Stunning, Robert. Wow. Quite a story too, the ocean is a beast! Thank you for sharing these wonderful images. I wish I could pop into any one of them and see the beauty for myself. Thanks Carrie for your comments. Yes the ocean can be treacherous if one is not careful, but the situation could have turned out much worse. I can always replace a camera, but I am really happy that I didn’t lose that image, as well as the others I had taken that day but had not downloaded on my back-up drive. Thanks, Leanne. Very kind of you to say. As I mentoned above, I’m glad the memory card didn’t get fried. I witnessed Robin’s heroic dive into the white, churning surf to attempt rescuing his camera. The rogue wave may have destroyed his camera, but not his spirit. After a quick towelling off, back-up camera in hand he returned to action! Shame about your camera, but stunning shots! Thanks and I am happy that the images survived. I think losing them would have been more depressing than the camera’s demise. Stunning and heroic shots, Robin! Bummer about your camera and lens… My worst nightmare! Yes, given your sailing experience, you know as well as anyone that it is essential to stay alert when around the water. Thanks for commenting, always good to hear from you. Thanks very much, very nice of you to say. Iceland was not at the top of my list for a long time, but my 2 photo collagues with whom I have traveled with kept telling me I needed to go there. They were right. Oh my goodness, Robin! That sounds quite the dramatic moment. Your adrenalin must have spiked. I’m very sorry about your camera and lens. The final image it captured is a wonderful tribute to its life however. Thanks, Laura; Thanks for the good thoughts. Rather poignant when you put it that way. I may re-title that last photo from the camera–“The Final Image” or something along that line. I really need to go to Iceland, looks like i need to start saving my pennies! Sad story but awesome shots! Thanks for the comments. 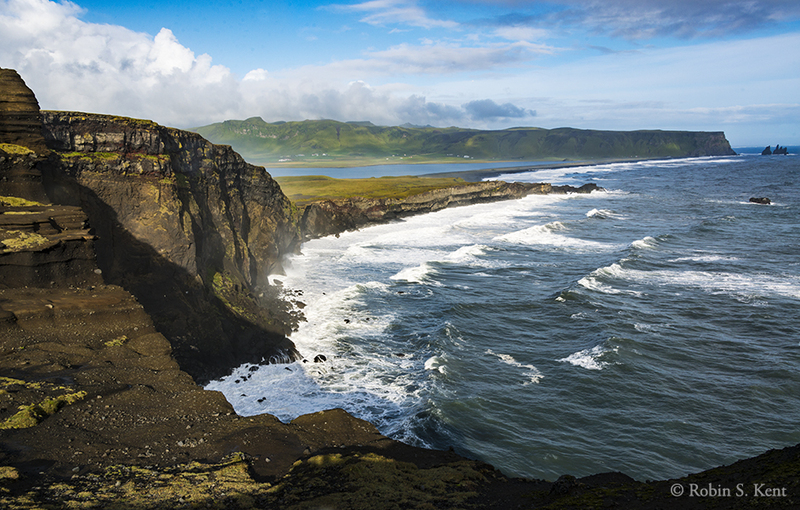 Yes, Iceland is not cheap, except for the airfare on IcelandAir. Those who are there to photograph and/or spend time at the scenic locations should avoid the tourist bus tours which spend very little time at any given spot. What an amazing place! Glad to hear the memory card didn’t go the way of the camera and lens. Recently, my husband and I took a photo workshop and one of the participants slipped on a rock while trying to get an image of the waterfall. She and her camera went down in the swirling waters. I hope her memory card was as lucky as yours. Waterfalls can be treacherous as well, especially the big ones. Yes, I hope her card survived also. Thanks, Denise. I appreciate it. This trip had more challenges than most, but it was a great experience, overall. Thanks, Faqeeha. I’m pleased that you liked the images. Yes, the back-up plan actually was a result of the Antarctica trip in February, when I realized ther would be no camera store within 1,000 miles. As it turned out, everything went smoothly there, but no so much on this trip. So I will have another back-up capability on the next major trip which will be a 3-week journey through the Northwest Passage(Greenland to Alaska) next year. Not after salt water. Fresh water? Maybe. But not salt water. Double Yikes! Depending on the fate of the files in the computer that could be a true disaster. Electronics just don’t get along with liquids of any kind, though you can occasionally (if you’re quick and/or very lucky) recover from fresh water dunkings. Data cards — on the other hand — are super tough and can survive unbelievable abuse (salt water, liquids of just about any kind, washing machines, being run over with a vehicle, etc.). Thanks for your comments on the images, I’m glad you liked them. As for the water, Mitch (see his comment above) is exactly right. The salt water totally shorted out the electrical circuitry. So the electronics were toast before I even got it out of the water. Days away from any repair facility, there was no hope of some kind of emergency “cleansing bath” to wash out the salt before the ireversible effects of corrosion had begun. That’s brutal, Robin. I’ve had three cameras bite the dust over the years (wind blew one over while on a tripod, one slid off my companions shoulder into salt water, and the third ate it when some jerks sprayed me with their dune buggy rooster tail), so I know the feeling. Thanks, Mitch. Yikes! Those are some tough experiences. The other guy in our group was luckier, he saw it coming and was able to hold his camera above the water until it was grabbed by another member. The next night, I saw another camera go down on the same beach. The shooter was not in our group, but that one spot seems to have a knack for eating cameras. The worst one for me was the camera that was on the tripod; it was my main and only camera at the time — so it was a very painful, very expensive lesson learned on that one. The other two weren’t my primary cameras, so I grumped about them only a little while. Ha! Sea glass! So, not exactly. But that got me thinking. The origin of the black sand on the beach, we were told, was the volcanic eruptions eons ago. But maybe it is really the ground up bodies of all those black cameras swallowed and pummeled by the waves. Bwahahahahaha — a black camera beach! (wipes eyes) Hah! Every one of these is amazing! Just gorgeous. Thanks, Laura. Very nice of you to say. Now that a little time has passed, I am thinking I’d like to go back to Iceland and see what else I can find up there. We covered the southern section pretty well, but I know there is more to find. You’re welcome. :). I’d love to go there some day but in the meantime I’ll enjoy your photos. Yes, I know. Being from Florida, I am quite embarassed by my momentary lapse. Thanks so much, that is great to hear. I’d advise that you go sooner rather than later. The glaciers of Iceland are retreating at a rapid pace and the general consensus is that they will be gone in 2-3 decades. Really? How sad to hear. Apparently, I am behind on world news effecting the climate. Thanks very much for your comments. It definitely is a beautiful place although the weather can be a challenge for some. But like any natural landscape, the weather is part of the experience that one is seeking. One thing to watch, however, is the menu in the restaurants. A number of them think it’s cool to serve puffin and/or Minke whale. Not everyone agrees with this. Another point, if you want to go, go sooner rather than later. As I mentioned to another reader, the glaciers in Iceland are retreating at a rapid rate and it is believed they will be gone in 20-30 years.